Many firms are certified to ISO 9000 for manufacturing, and the system requires certification of sensors and instruments used in production. As an example, a plastics extruder or injection moulder may have several hundred instruments and thermocouples in service, which “should” be certified. Checking controllers or recorders with a process calibrator, misses a common source of error, the sensor, and the best solution is to use a temperature source and check the thermocouple and instrument together. ECEFast have made this practical with a low cost dry well calibrator for temperatures between ambient +20C and 250C. It is fitted with 100mm deep test pockets for probes, of 3, 4.5 and 6mm diameter. Special inserts with other diameters can be supplied. 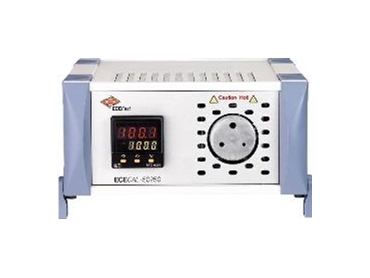 The ECECal delivers accuracy of +/-0.5C at 150C which is its reference point, but is within 2C over the whole range, even above 250C. Higher accuracy can be achieved and each instrument is supplied with a NATA certificate and this shows corrections if necessary.